This is our complex of luxurious western style chalets, which provide accommodation for our visitors and retreatants to the Temple. 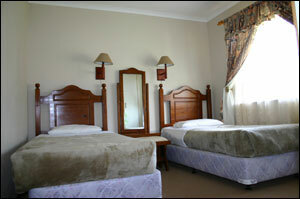 Each chalet has 2 bedrooms, one of which has a bathroom en-suite. The second twin bedroom has it’s own separate bathroom. There is a small kitchen where refreshments can be made and a small lounge area to relax in, thus a maximum of 4 people are permitted to stay in 1 chalet. Each chalet has security doors both front and back. The maximum group of people that we could accommodate at any one time would 200 people in Nan Hua Village. To review our pricing structure for the rental of the above facilities, we refer you to our Cost Information link.